The process of overseeding is imperative to growing a healthy, strong lawn that covers your property with lush grass. While fertilizing can go a long way to keeping your lawn healthy, after a few years grass plants slow their reproduction process. This gives weeds a better chance to grow and consume your lawn. If you need help with overseeding your lawn, a professional lawn care service can help you through the entire thing. Overseeding can be time-consuming, especially if you have a large lawn. However, it can be a relatively simple procedure, and the results are well worth it. If you want to overseed your lawn, there are steps you can take to make it a success. The first thing you have to consider is the time of year for your overseeding. September is generally viewed as the best time, but you can do it in early spring if you cannot do it in September. You will want to mow the lawn as short as possible seeds have the best opportunity to grow and thrive. Rake up all the grass clippings so the seeds can get into the soil, then loosen the soil using roto-tilling, aerating, or heavy raking. Determine the pH level of your soil. Ideally, it should be between 6.0 and 6.8. Ask a professional to help you or buy a kit to perform the test yourself. You have the option of applying lime to the lawn, as it will help balance the pH level. However, it is not required. You will want to topdress the lawn with a very thin layer of compost to help the seeds germinate. Too little is better than too much compost, as you do not want to bury the existing grass. Spread the compost with a rake until it is evenly distributed. Spread the grass seed evenly over the entire lawn by using the amount that is recommended on the seed packaging. Choose a seed that blends with your existing lawn, and remember that you really do get what you pay for, so cheap options are not always the best. You can lightly rake the area to help the seeds settle into the soil. 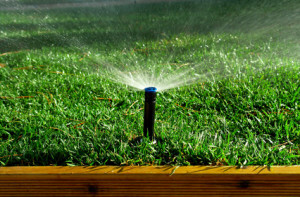 Water the lawn at least 3 to 4 times every day for the first few weeks so you can be sure the seeds will germinate. You can apply fertilizers as well, and remember to mow the lawn once it hits 2 to 3 inches in length.